Will the Scandinavian brand ever be the same? American car giant Ford Motor Co. has agreed to sell Volvo Cars to Chinese carmaker Zhejiang Geely Holding Group Co. Ltd. for $1.8 billion. The deal--which involves less than one-third of the $6.5 billion shelled out by Ford when it bought Volvo in 1999--is expected to be completed by the third quarter of the year. "Volvo is a great brand with an excellent product lineup. This agreement provides a solid foundation for Volvo to continue to build its business under Geely's ownership," Ford president and chief executive Alan Mulally said in a statement. He added that the sale of Volvo will allow Ford to focus on the Ford brand. The deal between Ford and Geely was signed at the Volvo headquarters in Sweden on Sunday afternoon. 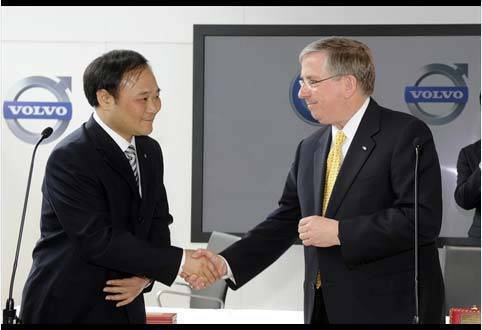 Signatories were Ford financial director Lewis Booth and Geely chairman Li Shufu. "We are pleased to have reached this agreement with Ford, enabling us to safeguard and strengthen Volvo's renowned brand heritage," Li said in a statement on Volvo's website. "This famous Swedish premium brand will remain true to its core values of safety, quality, environmental care and modern Scandinavian design." The Chinese car magnate has revealed plans to establish a Volvo factory in Beijing, AutoNews.com said, while saying production lines in Europe will remain. "I have a deep belief that the manufacturing footprint in Gothenburg and Belgium will be preserved in the longer term," Li said. "We want to stabilize and enhance the traditional markets in Europe and North America, and at the same time develop the other Volvo business in emerging markets, including China." Geely joined China's auto industry in 1997 and is currently producing more than 30 car models. The Chinese carmaker aims to produce 42 models by 2015.